Accessories Auxiliary Handle, Carrying case, Depth stop 210 mm After Sales Services For any queries please contact Customer Service Number - 1800-425-8665 (Toll free) Application Thus offering the best solutions to both industrial and engineering applications that include screw driving, drilling, cutting, grinding, polishing, and sanding etc. Brand Name Bosch Capacity 13 mm Contents In The Box Auxiliary Handle, Carrying case, Depth stop 210 mm Drill Capacity 26 mm Drill Diameter Drilling dia In concrete, hammer drill bits: 4-26 mm Opt. appl. Range In concrete, hammer drill bits: 8-16 mm Max. drilling dia. In masonry, core cutters: 68 mm Max. drilling dia. In steel: 13 mm Max. drilling dia. In wood: 30 mm Drilling Diameter in Concrete 4-26 mm Drilling Diameter in Steel 13 mm Impact Energy 0-3 J Input Power 800 W Item Weight 2.7 kg Length 377 mm Max. Impact Rate 0-4000 bpm Model GBH 2-26 E No Load Speed 0-900 RPM Output Power 280 W Part Number 0 611 251 655 Part Number 0 611 251 655 Power Consumption 800 W TSIN T06BOS0073 Usage Instruction This product comes with a user manual, please read the use manual carefully before operating the machine. Warranty 6 months Warranty Terms & Conditions Valid only through seller/manufacturer; Tolexo is not liable for any warranty claims. Please read the usage manual available with the product to understand product usage and warranty T&C. Any other information regarding warranty can be obtained from brand website or by contacting seller.How to Claim Warranty 1. Please contact the Authorized service center of Brand (list available online) for claiming product warranty and service related issues. Width 83 mm Function Infinitely variable speed control Forward/reverse operation Electronic Overload clutch Height 210 mm Key Features Toolholder: SDS-plus. 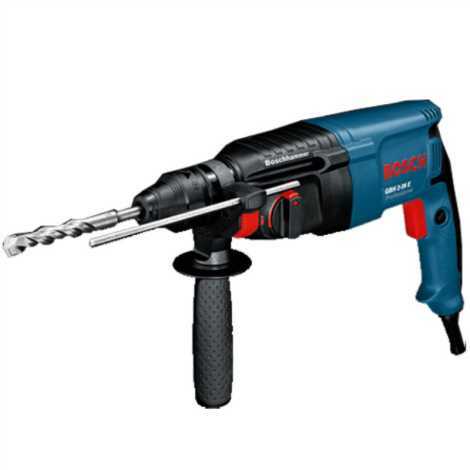 Hammer drilling in concrete, Vibration emission value ah: 15 m/s, Hammer drilling in concrete Uncertainty K: 1.5 m/s. Chiselling Vibration emission value ah: 14 m/s, Chiselling Uncertainty K: 1.5 m/s. Superior drilling rate in the 2 kg hammer class. Easy-to-change toolholder. 50 mm spindle collar diameter for more sturdiness. Special Features Impact stop for drilling in wood and steel. Ball grommet for preventing cable breaks. Softgrip on main handle and auxiliary handle. Overload clutch.